10% off Appliances Offer ends April 24. 10% off discount taken off of Special Buy retail. Limited time offer. The Best Cleaning in its class is driven by the PowerWash cycle and features the extra cleaning action of the Power Impeller to attack stubborn stains. The PowerWash agitator tackles any load size with both ef cient, concentrated cleaning to ght stubborn stains and robust wash action to help break up messes. Better Built for Best Cleaning in its class driven by the PowerWash cycle, this 4.2 cu. 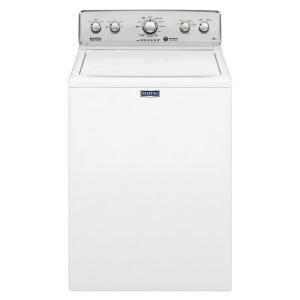 ft. capacity top load washer tackles both stubborn stains and crusted-on messes. For more water when you want it, the Deep-Water Wash option offers a maximum fill to help rinse away soils, while the PowerWash agitator provides concentrated cleaning and robust wash action to remove tough stains. 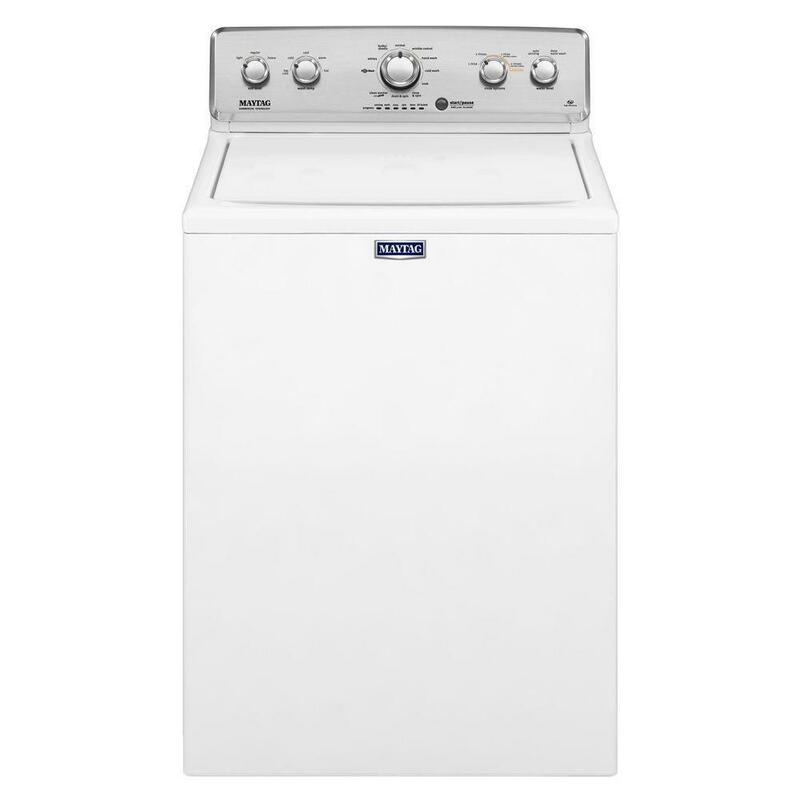 Plus, the Deep Rinse option on this high efficiency washer helps eliminate excess detergent and fabric softener to ensure the ultimate clean for every load. Add a 10-year limited parts warranty on the drive motor and wash basket and you've got the power to clean tough loads for the long haul. Sadly, I can not give a reason to keep it! I hate mine too. I've always loved Maytag products until now. Believe it or not my last Maytag washer lasted 40 years. I loved it!! The drum started leaking, and I figured it wasn't repairable so I bought this nightmare two months ago. Now I wish that I'd lived with the leak . It was still washing clothes and getting them cleaner than this new machine. All I can say is that from everyone I've talked to about washers, there are none that people like. Ever since they put in the sensors and made them &quot;efficient&quot; the machines don't clean as well and take twice as long to wash. If it's any comfort, we're all in the same boat! Is the agitator like an auger, or just a straight up and down? Neither actually, there is a very low agitator looking piece in the center (about 2.5&quot; tall) with an array of holes. It basically works by primarily moving the wash water &amp; rinse water through the fabric &amp; agitating by the wash water moving &amp; the clothing, etc. appearing to stay in about the same place at times. It is like the wash water is coming from multiple directions. Most thorough washer I have used in 50+ yrs. Totally different design concept than the conventional washing machine. It is noisier but it is a sophisticated mechanical machine. Does this washer have an agitator? My washer takes an hour to wash is that normal. 4.2 cu. ft. High-Efficiency White Top Load Washing Machine with Deep Water Wash and PowerWash Cycle is rated 4.4 out of 5 by 10094. Rated 2 out of 5 by NoTime4This from After 22 years of solid performance, my old washer finally gave up the ghost. Technology has chan... After 22 years of solid performance, my old washer finally gave up the ghost. Technology has changed so that I could not find another basic machine like it. This top loading, agitator Maytag was the closest thing to what I wanted. After 3 months of use, I regret this purchase. I don't like that you can't start the water until after the lid is closed. (Actually hate the locking lid feature). Next, the agitator ties the clothes up in a tangled mess no matter which setting I use. Wrinkle control? Not. Handwash? Not. Deep Water fill? Not. Even though I use very little detergent as recommended for HE machines, you can see soap residue on dark clothes when you untwist them after the final rinse and spin. And finally, the load becomes unbalanced on the spin cycle at times and sounds like it is trying to shake the house apart. I have never been a fan of front loaders but now I wish I had gone with one of them instead of this piece of disappointment. Rated 1 out of 5 by Donotshophere from This washing machine did not work. Ever! Right after installation we complained that it would not... This washing machine did not work. Ever! Right after installation we complained that it would not cycle through any washing, and it did not spin. First we were told to call Home Depot; then Home Depot told us to call the "Whirlpool Experience" line, who told us to call Home Depot. Finally we were told that there was a 48-hour customer satisfaction guarantee, and we should call the Whirlpool Resolution line. The resolution team told us to call the Home Depot resolution team. Finally a technician was supposedly scheduled to verify that the machine did not work. He did not show up on the date they said he would come. Another two days and 4 hours late, a technician verified that the controller board was defective. Next the Whirlpool Resolution team wanted us to call Home Depot to schedule a pickup! We have gone without doing laundry for 3 weeks now, all because Home Depot and "Whirlpool Experience" cannot get their act together. Rated 3 out of 5 by Cometwatcher1 from The only good thing about this washer is that it can wash a very large amount on the deep water s... The only good thing about this washer is that it can wash a very large amount on the deep water setting. The auto sensing feature is HORRIBLE. Soap residue is left all over clothes with the auto sensing feature. You really only have two washing choices: deep water or auto sensing and auto sensing doesn’t even cover the clothes with water so every load we do has to be set on deep water to properly clean them and it takes FOREVER! Maytag, PLEASE make an old style washer that allows me to choose what water level I want and stop trying to make a “smart” washer. My last washer was 25 yrs old before I replaced it with this practically useless piece of junk and now I am seriously considering buying a used, old school washer that gives me a choice on what water level I would like. Is they anyway to override the auto sensing feature and have a choice in a small, medium or large load? We are giving a rating of three stars because the washer is good for very large loads and bulky items but not good for at all for small or medium wash loads. Very unhappy Maytag washer owner. Rated 1 out of 5 by Dissappointed from Worst washer and dryer I've ever owned We purchased this washer and the matching dryer. The machines were installed today after waiting 2 weeks because the washer was backordered. I washed 2 loads of laundry and had to run the wash cycle twice to get the clothes clean. The clothes did come clean after the 2nd cycle however they were covered in lint, for some reason. Put them in the dryer and they would not dry. We cleaned out the vent before install, so there isn't a blockage. We checked all troubleshooting options and couldn't find any issues. I tried everything...different cycles, different temps, removed nearly all of the clothes. Finally, the few items left in were dry after 6 or 7 hours (but black items are still covered in lint). We ended up rigging a clothes line in our closet and have hung the rest of the clothes to dry. The machines are also very loud, but could live with it had it not taken all day to wash and dry a load. I can't express the extent of my disappointment with these machines. I'll be calling Home Depot tomorrow to see about returning them. Rated 1 out of 5 by babs from This is the most complicated washer I have ever used. I am CONSTANTLY referring to the manual to... This is the most complicated washer I have ever used. I am CONSTANTLY referring to the manual to make sure I am using the right settings. The loads take twice as long to run as my previous Maytag, the clothes are not cleaner and I have had to unplug the machine multiple times to get the spin or lock lid light to stop flashing. Really disappointed with this product, but the service from Home Depot was even worse. Had expected that when I paid for installation the machine would be hooked up that day. Ordering online, the fact that you have to purchase hoses separately is NOT CLEAR. Thus I waited for an ENTIRE WEEK before they could schedule hook up, and despite promises that there would be compensation for the bad experience NONE of my phone messages to the customer relations manager at the Reading MA Home Depot were returned. This is the last time I will patronize Home Depot. Never experienced such bad service, which I will share. Hello Lowes! That is where I will be going when we remodel our new home.